On this page, you can start a manual batch or import a ShelbyTELLER batch. 1. 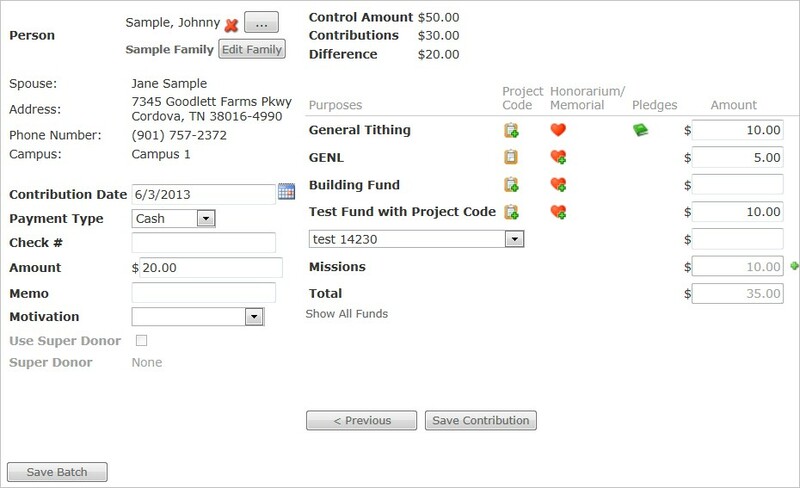 From the Contributions menu, click the Contributions Entry option. 2. 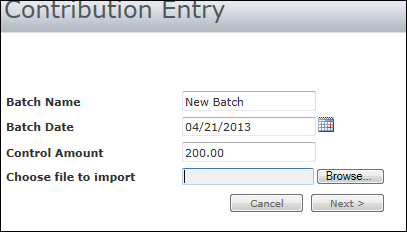 Enter a Batch Name, Batch Date, and Control Amount. You can also import an xml format file such as Shelby Teller. 4. Click the Search icon to search and select by name, address, postal code, envelope number or phone number. Arena adjusts the default search option based on the last choice used by user. Enter at least one letter for first and last name if searching by name. Click the Add New Person button to add a new record. •Name/Person ID – Use this option to search using any part of the first or nickname and at least the first letter of the last name. •Address – Use this option to search using any part of an address. •Postal Code – Use this option to search using any part of the zip code. •Envelope Number – Use this option to search using any part of the zip code. •Phone Number – Use this option to search using any part of a phone number. You can use the % or _ wildcards with all search options. Select the radio button to the left of the desired record. 1. Enter all information for this contributor. Press the “Tab” key or the “+” key on a 10-key pad to move to the next field. •Search icon – Use this icon to search and select an existing record. Optionally you can click the Add New Person button to enter a new record. Once you select or enter a record, the Edit Family button displays. Click the Edit Family button to open the Edit Family Wizard window. Changes made update all existing records. If changes are not necessary, press the “Tab” key on your keyboard to move to the next field. 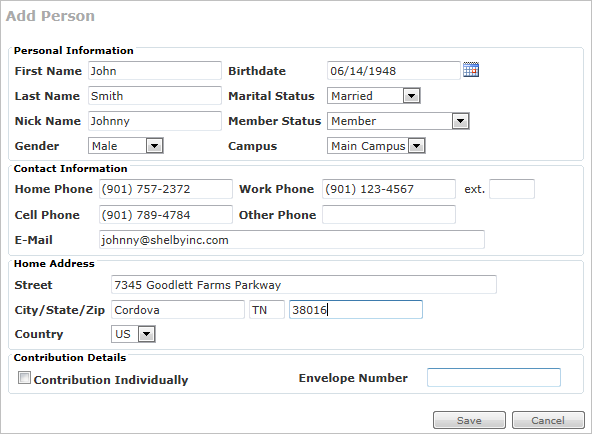 Once you select or enter a person, Arena displays the spouse if applicable, Campus if applicable and envelope number if applicable. •Contribution Date – The default date is the same as the batch date. To change the date, enter the date in MMDDYY or MMDDYYYY format or click the Calendar icon to select the date. •Payment Type – Use the drop-down list to select payment type. 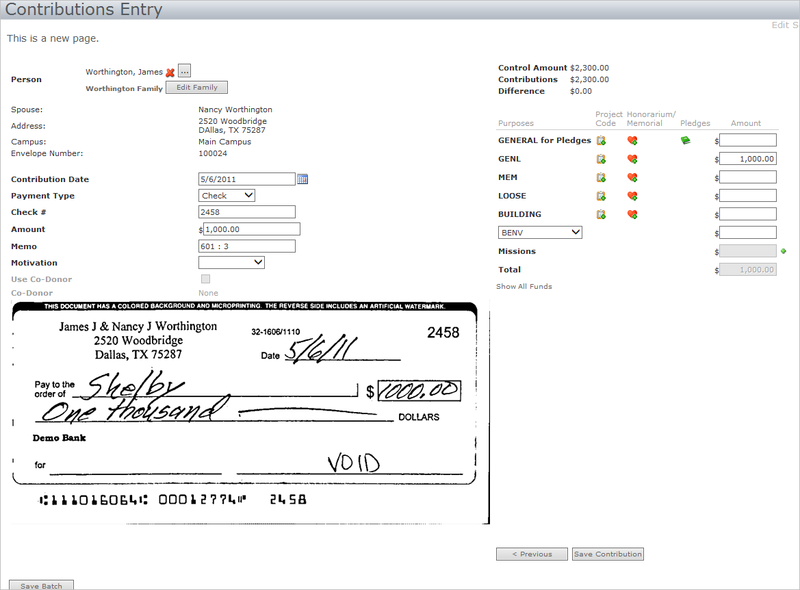 Default payment types are cash, check, e-check and non-cash. All contributions are credited to Funds that allow pledges. Press the “Tab” key to move to the next field. •Check # - Use this field to enter a check number. Press the “Tab” key to move to the next field. •Amount – Enter the contribution amount. Amounts must be greater than $.01. Press the “Tab” key to move to the next field. The amount posts to the first Purpose (Fund). Press the “Tab” key to move to the next field. •Memo – Use this field to enter a memo for the contributions. Press the “Tab” key to move to the next field. •Motivation – This optional drop-down is a customizable list of contribution motivations. Press the “Tab” key to move to the next field. •Sub-Donor – Use this option to associate the contribution with the sub—donor to the contributor. You can assign a Sub-Donor on the Person Detail page. 2. Enter the contribution information. •Control Amount – This is the control amount for the batch. •Contributions – This is the amount of the current contribution. •Difference – This is the difference between the current contribution entry and the batch control amount. •Purposes column – Arena displays priority funds. Use the purpose drop-down box to select a non-priority fund. Funds display alphabetically by Category and then alphabetically by fund. •Project Code column – Click the Add Project icon to select a project code. The Project Code icon displays once you associate the contribution with a project code. •Honorarium/Memorial column – Click the Add Honorarium icon to associate the contribution with an existing honorarium. Once you associate the contribution with an honorarium, the Honorarium icon displays. See your Arena Administrator if this column is not available. •Pledges column – The Pledge icon displays if the contributor has an existing pledge for a fund. Hover over the Pledge icon to display pledge details for the fund. See your Arena Administrator if this column is not available. •Amount Column – The amount you enter auto-fills to the first fund. Press the “Tab” and “Delete” keys to move to a different fund. 1. Enter the amount for the Purpose. 2. Select the Show All Funds check box to display all active funds. Click the Project Code icon to select a Project Code. If you know the project code number, enter in the Code field. 3. Click the OK button to return to the Contribution Entry page. 2. Click the Add Honorarium icon to select an honorarium code. 3. Select the honorarium from the Available Codes drop-down. If you know the code, enter in the Code field. 4. Click the Ok button to return to the Contribution Entry page. 1. Click the Pledge icon to display pledge status. 2. Click the Ok button to return to the Contribution Entry page. 1. Click the Mission Donor icon to display all active mission trips. 2. Select the Mission Trip to display all travelers and enter the amount for the traveler. All Active Mission Trips display by default. 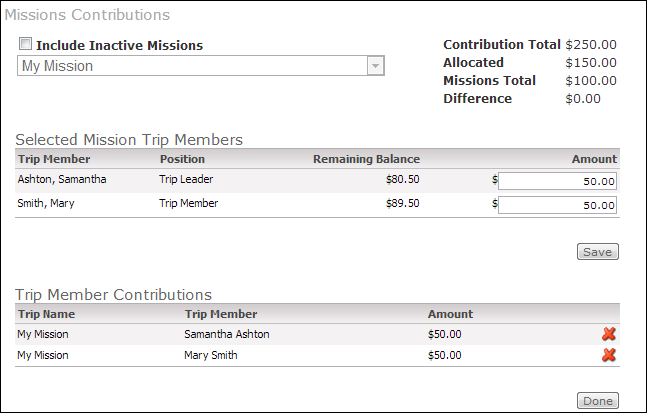 Select the Include Inactive Missions check box to display inactive mission trips. 3. Click the Save button then the Done button. 4. Click the Save Contribution button. 5. Click the Save Batch button when all entries are complete. 6. 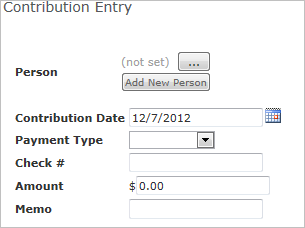 Click the Contribution Detail link to edit the contribution. 7. Click the Delete icon to delete a contribution.